Including my father, three of my grandparents’ five children were in the Foreign Service, and home leaves occurred bi-annually. 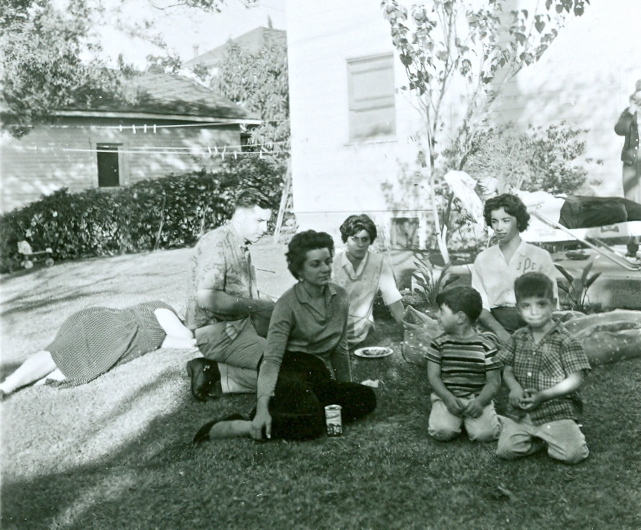 Our visits to Los Angeles, lasting two to three months, usually didn’t coincide, but once in a while all three invading families at the same time occupied our grandparents’ home. Stuffed in like sardines, we filled every room in the house except the off-limits inner sanctum where the old folks slept in their ancient sagging double bed. If it’s true that fish and guests stink after three days, the house was surely toxic during the months we stayed in it. One of the bedrooms was papered with Mother Goose wallpaper for the countless babies who slumbered there through the years. The room was comforting with Little Jack Horner, Jack and Jill, and Mary and her Little Lamb watching over us as we dreamed. The last time I slept in the happy nursery, I was 20 years old and my 21 year-old cousin Cathy, was gently snoring in the twin bed next to mine. Attached to the house, just off the second story landing, was a screened-in sun porch, where my grandmother pedaled her sewing machine, and my grandfather sat clacking at the oldest typewriter in the world writing his memoirs, “The Story of My Life As I Remember It.” The porch frequently served as a fourth bedroom where the extra sardines were billeted, and where as a young girl, I sang Rock-a-Bye-Baby over and over and over again to my stubbornly wide awake baby cousin, Johnnie. The house was a symphony of sounds. The shouting and laughter of a steady stream of visitors provided a backdrop to the eternal whomp-whomp of the washing machine in the small laundry room adjacent to the kitchen, which in its turn, produced a perpetual percussive clank of pots and pans. Upstairs in the one and only bathroom, the toilet flushed endlessly until the year my desperate grandparents broke down and installed another one in a tiny broom closet next to the washer. We kids spent a lot of time in the gigantic back yard, hiding in bushes, swinging from trees and showing off our spectacular cartwheels. We wrote clever musicals, and then persistently pestered the adults until they caved in to watch us sing and dance in them. We didn’t write endings, but instead relied on the anticipated attrition of our captive audience to determine when to stop the show. And sometimes, we just looked up to discover that our exhausted grandmother had passed out on the lawn. Those were the days! So innocent…….Who is that sitting behind Johnnie and Jimmy? I love it! If I’m 4, that puts Johnny at 3, my mom at 37 and Aunt Tina at 24. Keep ’em coming. I love your stories. And inevitably you crack me up at the end!